Global dependence on Chinese products: 30% chance of a Made-in-China label in your closet. 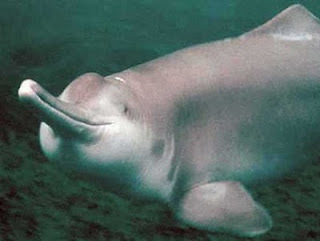 The Chinese White Dolphin is a remarkable creature, the species is unique by the fact its that their skin will slowly turn pink as it grows up. However as of 2010, there were as few as 751 China white dolphins left in the Pearl River Delta (PRD) in Southern China; an alarming number that has put them on the IUCN endangered species list. Part of the reason for the decline in population is the massive water pollution in the PRD, which reduces the supplies of fish to meet the dolphin’s massive appetite. Consider this, three to four -out of five commodities you pick from any supermarket shelf carries the label “Made in China”. There is a 30% chance that you will find the “Made in China” label in your closet. And your kids’ favorite toys?… 70% chance they come from China. As the majority of manufacturing in China takes place along the PRD, anything you purchase is very likely to be consuming the region’s resources. Come to think about it, we are not any less dependent on the PRD than the dolphins. Fresh water has always been a critical element in garment production. It plays a part throughout the supply chain from farming cotton, to cleansing, bleaching and dying all the way to household washing. As the world has increased its dependency on sourcing and production from China, (partly because of the aggregate low cost of manufacturing) more and more factories are being constructed throughout the basin. This means more freshwater is being extracted for industrial use. As the river system is also a major fresh water source for many cities, including Hong Kong, more water used for production means less water for agricultural uses and drinking. What’s more, many irresponsible factories are using hazardous chemicals to improve profit and then dispose of the untreated industrial wastewater into the same river; damaging the precious water source. The more we depend on production in China, the less fresh water we will have. We are entering an era of potential water wars. As plentiful as water seems to be, only 2.5% of the world’s water is fresh water. Within this 2.5%, 69.5% of fresh water is locked up in icecaps and permafrost. 7% of the world’s fresh water reserves belong to China2. Besides supporting almost 20% of the world’s population, China has to also manage supplying freshwater for production demands from all around the globe3. We simply do not have sufficient water supplies to support the current situation. In addition China also owns the headwaters for many countries in South and South East Asia, including famous textile production alternatives such as Bangladesh, Cambodia, Thailand and Vietnam. If China cannot manage its water resources efficiently and impacts the supply of neighboring countries we can expect competition for water to escalate to an international level. Simple economics suggest that as the demand for freshwater goes up, so does the price, hence driving production costs upwards. Judging from analysts that suggest the cost of water in China is 300-500% lower than comparable nations with equally scarce water supply per capita, we can expect a paradigm shift in cost structures if water is to be valued correctly. And we are not only talking about garments, but also other water intensive industries such as electronics, agriculture and mining. Eventually, increasing costs will be reflected in the price tags of your jeans, your bottled apple juice and your iPhone. The effect is potentially unimaginable when we consider that water even plays a critical role in power generation. Put simply, any production (or service) that requires electricity will be affected. China is renowned for its cheap manufacturing that provides alternatives at a bargain for countless commodities. As a result, procurement teams flood into China looking for the cheapest source to improve profit margins. In an effort to outbid competitors, some factories chose to use chemicals that can lower production cost. However, we have seen a tightening of the safety and environmental regulations as the world progress. Many of these chemicals have been identified as hazardous to either the human body or the environment, and have been replaced by higher cost solutions. Unfortunately, under the current cost focused sourcing structure, many factories are incapable of making the switch by raising prices because buyers can easily find a production replacement so long as they are willing to look further inland to remote rural areas where the labor cost can be lowered. Since the procurement teams are incentivised by cost savings, this becomes their number one priority and in some extreme cases they turn a blind eye to irresponsible activities. In doing so, they fail to reward responsible manufacturers. 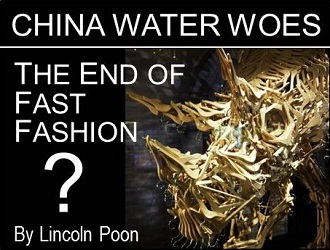 China’s water crisis and rise in rural protests could indicate that we have reached the tipping point where we can no longer standby and sacrifice water quality and our environment for affordable fashion. Affordable fashion has also nurtured the modern trend of mass consumerism. As the cost of buying a product that may not be fashionable the next season is lowered, consumers are indirectly encouraged to make an impulsive purchase. In addition, consumers adopt the habit of throwing away outdated fashion guilt-free, since the monetary value of such waste is small. Instead of mending a broken shirt, one may simply buy a new shirt. What we are unaware of is that we are simply failing to utilize the full potential of the product life cycle. Every year the US discards on average 13.1 million tons of textiles to landfills4, much of which is in good condition and the majority of which is recyclable. In buying a complete new replacement, we are simply giving up the opportunity of utilizing resources, to waste more. We are not playing the “blame game” here. Conserving our resources is never a game. The US has been shifting its production to China since the 80’s and currently, there are still some 40% of rivers and 46% of lakes in the US deemed too polluted for swimming or aquatic life5. It just proves that the problem of pollution and resource wastage generated from mass consumerism is not just a China matter, but a global issue. No matter what country we produce in, pollution follows if we continue to blindly focus on producing the same product at a cheaper price. If we do not change our current lifestyle, pollution from textiles in China will shift to its successors, be it Bangladesh, Vietnam or Cambodia. What can we do? Start appreciating and stop craving. Start appreciating the quality and durability of your purchases. Previously, we bought a pair of jeans because it can last for a lifetime, but now we crave for the latest fashion season after season. We use to prefer a TV that can operate for over 10 years, but now we want a TV with the latest 3D technologies; the one you bought a year ago is already obsolete. Brands through advertising entice us to buy more, but on the flip side of the coin we are just consuming Earth’s precious resources faster than we actually need. “Slow” fashion is an effective way of protecting our water and other resources. Start craving for water friendly products. Living in a demand driven economy, brands are always exploring ways to capture market opportunities. If each of us can start desiring water friendly products, we can form a market force. Very soon brands will realize this opportunity and develop products accordingly. This will encourage brands to regulate their suppliers not to pollute the water. By discouraging production and demanding responsible manufacturing, we can help preserve water. We’ve seen many eco and carbon friendly successful stories, so I am sure we can do the same for water. Our voices are being heard. A number of industry leading brands have already join force to make a change. In 2007, the Outdoor Industry Association (OIA) members joined forces with a mission to create an index that incorporates environmental considerations into product designs and to manage their supply chain. After years of voluntary contributions by all the members, including the Sustainable Fashion Business Consortium (SFBC), a major representation of the manufacturers along the Pearl River Delta, The Eco Index was born to revolutionize the product development process with full transparency in environmental pollution, including water, of the product so that designers can make improvements to reduce pollution. The success of the Eco Index has quickly spread beyond the outdoor industry, and since its handover to the Sustainable Apparel Coalition (SAC) the adaptation expanded to the apparel and retail industries. The Sustainable Apparel Coalition Index (SAC Index) is determined to establish itself as a common, external-facing index that consumers can easily understand about the emission of their purchase. This means it will encourage brands to increase its awareness in the pollution of its products, and tighten control on factories that produce excessive water pollution. There is no escape. If water supply in China is threatened, the whole world suffers. Cheap alternatives of everything that China dominates will no longer be cheap, and fast fashion can no longer afford to be fast. We’ve been enjoying affordable fashion at the expense of our environment and it has caught up to us. As the world population continues to rise while the size of the earth and its natural resources remain unchanged, we need to learn how to effectively allocate our resources to sustain everyone. The old days of mass consumerism must come to an end, and we need to restore our appreciation in quality and the full product life-cycle . China’s water risk is a global threat and if we can all make a small change to our shopping habits we can make a difference. If we do not take good care of our environment, we may be next on the list after the Chinese White Dolphin. 3Business Insider, China produced 19.8 percent of all the goods consumed in the world during 2010. The United States only produced 19.4 percent. 4Mother Nature Network, According to EPA, 13.1million tons of textiles are trashed each year, and only 15% – or 2 million tons are recovered for reuse or recycling. 5Do Something, 40% of America’s rivers and 46% of America’s lakes are too polluted for fishing, swimming, or aquatic life. Lincoln is the Global Brand Manager for Pinneco Research Limited, a pioneer in fiber-insulation innovation, delivering superior product solutions and eco-engineering. As a key global advocate for environmental conservation, Pinneco is committed to eco-friendly product development in strict accordance with the world’s leading environmental standards.